The vibrant Thames Barrier Park boasts spectacular views of the River Thames and is surrounded by sunken gardens and wildlife, making it a great location to join us for our group HiiT fitness sessions. The riverside promenade and modern landscaping offers the perfect location for a One Element picnic with a great chance to meet others in the local community! Come and join us for a FREE TRIAL and see how our members get fit and social. 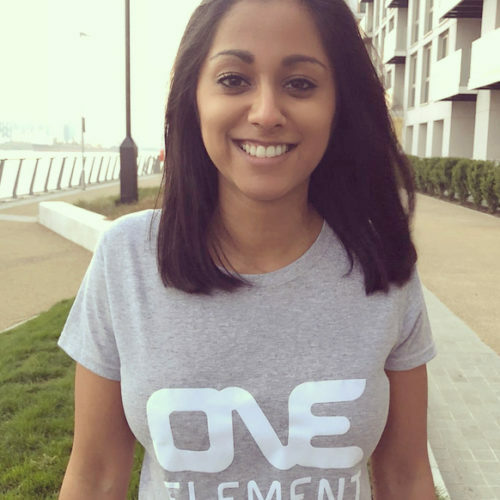 Rhea is running One Element Docklands and became the franchise owner after pursuing her passion for team sport and outdoor fitness. She is excited at the opportunity to bring together communities of like-minded people to fulfil their fitness goals whilst also being part of a social hub. You can access Thames Barrier Park and café from North Woolwich Road by the staircase at Barrier Point Road. It is located adjacent to Pontoon Dock DLR station and next to the new Royal Wharf development. What is your fitness background? Team sport has always been a passion of mine and every Lacrosse and Netball team that I've represented has been with many of my closest friends. After a number of years in the City, I decided to turn my enthusiasm for fitness into more than just a hobby and join the One Element family as a Fitness Coach. What gives you the most satisfaction from One Element? You feel an indescribable energy from members from the outset, whether rain or shine. There is no other place where fitness sessions and socials can bring together those of all ages and abilities to create life long friends. Best meal you have ever had? The Sunday roast after running the London Marathon! What do you do in your free time? I love to travel and experience local culture, food and drink around the world. As well as playing sport, reading and singing, I also maintain a loyal but ever-turbulent relationship with Arsenal Football Club. What is your favourite quote? Never underestimate the power of a well placed apostrophe. You will be greeted by your One Element Trainer (wearing a One Element top with ‘Trainer’ on the back) and introduced to some of the long-term members. Once the session starts you’ll see our members have hugely varying levels of fitness but they all train together and you’ll be encouraged to take training at the pace that works for you. The main body of the session lasts about 45 minutes and differs every week. We finish each hour-long session with a spot of core training and a good stretch.